The life and example of St. Anthony Zaccaria can help us to live a more authentic Catholic life in the midst of the modern world. By familiarizing ourselves with the life and times of this priest and doctor, we can apply his principals of holiness to our daily lives. These principals are clearly defined in St. Anthony Zaccaria's letters, famous sayings, sermons, constitutions and teaching on various topics. However, all the teaching in the world would be meaningless if the life did not reflect the writing. 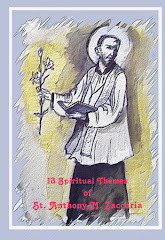 In the study of St. Anthony Zaccaria, we learn how he put his preaching into practice. His life is a concrete example of his teaching. In fact, it is sometimes difficult to determine which came first, the practice or the preaching. As a young boy in Cremona, St. Anthony displayed a love for poverty and for the poor. He gave away his clothes and food to those less fortunate. He shunned the luxuries associated with the nobility into which he was born. In order to better serve the poor, he gave to his widowed mother his inheritance and requested from her only the basic necessities. He excelled at his studies and became a physician. In treating his patients, he realized their need for spiritual as well as physical healing. He answered the call to the priesthood and took for his inspiration and model the tireless Apostle Paul. 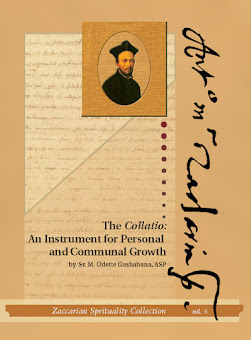 In order to effectively treat the illness that surrounded him, he became a great reformer of the Church. 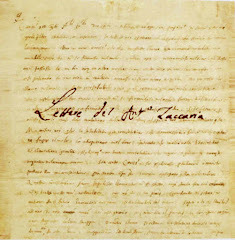 Pope Clement VII, in 1533, granted St. Anthony's request to form a congregation dedicated to the reform of the Church and of the people; the Clerics Regular of St. Paul. Because this congregation had as its "home" the Church of St. Barnabas, they became known as The Barnabites. He later founded the Angelic Sisters of St. Paul, which proved to serve as an example for the reform of other monasteries, and also a Congregation of Laity of St. Paul. In all his undertakings, St. Anthony contemplated Christ Crucified. He spread Eucharistic Piety through the establishment of the Forty Hours Devotion. In short, St. Anthony employed all his strength in serving the Lord and His Church durning his short life. His writings serve as a reflection of his deeds. In the midst of our everyday busy lives, we can look at St. Anthony's writings and reflect on his busy life as an inspiration to grow in holiness. When we consider his love for the poor, we can also listen to his advice: "If you are generous, you will learn to conduct yourselves with the law engraved in your hearts, rather than with external laws". In shunning luxuries we hear him tell us, "reflect and see what great harm is caused by seeking one's comfort......do not foolishly try to be equal to others by imitating their way of behaving and talking". In contemplating his excellence in his studies we hear him tell us, "While working, thinking, or planning, frequently lift up your mind to God". When we consider his compassion on those who need physical healing, we can heed his advice to "Take great care of the sick and diligently look after them". In considering his ability as a doctor we can contemplate his thoughts on spiritual surgery: "Anyone willing to become a spiritual person begins a series of surgical operations in his soul. One day he removes this, another day he removes that, and relentlessly proceeds until he lays aside his old self". In his love for Christ Crucified, St. Anthony shares the benefit he gains from this practice, "Enter into conversation with Jesus Crucified as familiarly as you would with me and discuss with Him all or just a few of your problems....if you practice this way of prayer, I can assure you that little by little you will derive from it both great spiritual profit and an ever-greater love relationship with Christ....Remember that Jesus Crucified has always been abundantly generous with you". Lastly, St. Anthony's words and example encourage us to follow him in the path of saintliness which transcends time. "Do not think that my love for you or the good qualities you are endowed with may have me desire that you be just little saints. No, I greatly desire that you become great saints.....All that is required to become great saints is that you really mean to develop and give back to Jesus Christ Crucified the good qualities and graces He has given."